I was excited to see this production of The Children’s Hour, directed by Daniel Wood, brought to the Ballard Underground by Arouet. The play, written by Lillian Hellman, was originally produced on Broadway in 1934, and at the time it was so daring with its themes that it was almost disallowed; before The Children’s Hour, any mention of homosexuality on stage was illegal in New York State. The 1961 film has always been one of my favorites, precisely because of its surprising audacity in containing a sympathetic queer character (played by Shirley MacLaine, no less). Yet, watching the story unfold in a modern context, I confess that I wondered why this story needs to be retold. It was progressive in the thirties, and even in the sixties, but now it’s an aggressively conservative story that takes it as granted that homosexuality is at best a psychological affliction. This isn’t to say that the script has nothing else to offer: it’s about the power of gossip and lies and the toxicity of self-righteousness. And of course, when breathing life into old stories, it is to be expected that some unsavory social ideas will show up in small ways. But in The Children’s Hour, homophobia is the cement that holds the other thematic bricks together. Before discussing the other aspects of the production, I want to note that in choosing a play to produce, you choose a narrative to revive, and you must choose responsibly. The compelling themes in The Children’s Hour can be found in many other plays that are, in addition, socially responsible. Still, it was well-performed. Lindsay Evans and Kayla Lian (Ms. Dobie and Ms. Wright, respectively) were wonderful in their lead roles, presenting both rich characters and rich relationships, and natural character arcs throughout. Tom Stewart and Sally Brady (Dr. Cardin and Mrs. Mortar) were both quite good, as well, although their performances were so stylized that they both seemed just a tiny bit incongruous next to the seriousness of Evans and Lian. The supporting acting was fine. It’s all a little clumsily directed, with a lot of standing up and sitting down that seems to serve no purpose other than to give the audience action to watch. Real period clothes are hard to both find and make convincingly, so a lot of the time you just dress actors in modern garments that approximate period clothing. It is very difficult, therefore, to tell what decade the piece is actually set in. In this case, I may not have noticed if I hadn’t been looking for it. The costumes were for the most part very believable for the characters who wore them. I greatly enjoyed Mrs. Mortar’s twenties-era diva-of-the-stage shawls eleganza. It was a perfect visual accompaniment to her wholly absurd character. Furthermore, the set is nice and spacious, with some gorgeous pieces of furniture. Similar to the costumes, it didn’t lend a really water-proof period-accurate seal to the play, but it was good enough that it didn’t bother the eyes. Over-all, the production is fine. The actors did a good job despite direction that just didn’t serve the script very well. Visually, it was perfectly nice. Yet as I left the theater, I could not stop grappling with the conundrum of why a 21st century audience needs to see this play, and not one of the countless others that deals with the same themes without throwing lesbians directly under the bus. 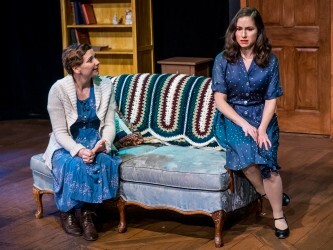 Lillian Hellman’s The Children’s Hour, presented by Arouet and directed by Daniel Wood, runs from May 14 to May 31, at the Ballard Underground (2220 NW Market St, Seattle). For tickets, please visit BrownPaperTickets.com or call 206 395 5458.